Sharing your baby’s first Christmas with your extended family can be magical—and fraught with stress. Here’s how to get organized, make the trip, and make the most of the time together. Some time this year you’ve had a baby! And your family can’t wait for December so you can bring the bundle of joy hometo show everyone and celebrate baby’s first Christmas. No doubt, you appreciate their excitement; maybe even share it. But there’s probably a lot you’re also worried about, from the logistics of getting there and back to the thought of extended time with relatives who have very different views from your own on parenting. These five tips can help you have a stress-free (ok, probably more realistically lessstressful!) tripwith a baby and enjoy Christmas with extended family and your new addition. Choose your travel dates wisely. Getting through the airport for the first time with a baby—and all the extra stuff a baby travels with—is daunting. You don’t want to do it on the busiest travel day of the year, when stress levels are high and patience is low for airline and airport staff, as well as your fellow travelers. The best days to travel at holiday time are the holidays themselves. Thanksgiving, Christmas Eve, Christmas Day, and New Years Eve offer the lowest priced tickets and smallest crowds. The worst days to fly are one and two days before each holiday, and the last day before work and school start again, when you might face huge travel delays—usually Thanksgiving Sunday, and January 1stor 2nd. Traveling on the holiday won’t kill your day, especially if you book direct flights (which you absolutely want to do). Leave the east coast at 8:00 AM on Christmas (or Thanksgiving) morning and you’ll land on the west coast around 11:00 AM—plenty of time for exchanging gifts, taking a nap, and eating a huge holiday dinner. And let’s face it, with a small baby, your New Years Eve will probably be an early night anyway, so why not take advantage of a notoriously easy travel day? Pack, check, and ship the essentials. The great thing about going to visit family is that you have a mailing address. Cut down on what you have to pack for your baby by shipping yourself a care package with presents, your travel crib if you need one, and maybe a week’s worth of diapers. On the way back, fill a box with that travel crib and all the presents you received. 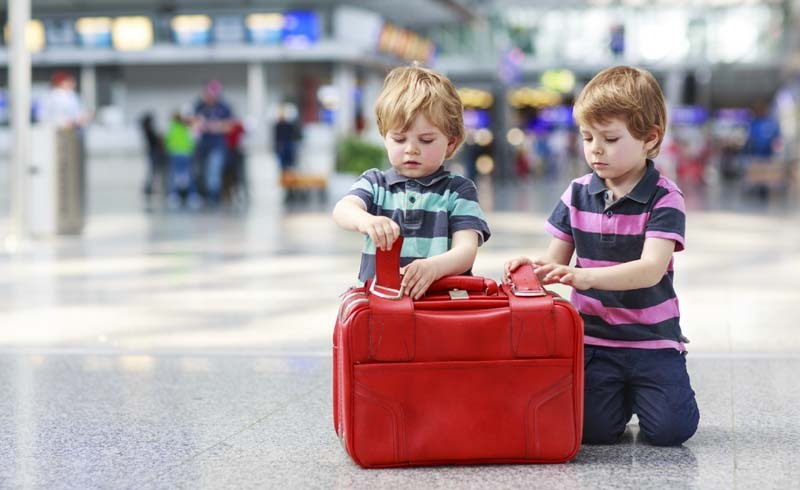 When it comes to packing your carry-on bags, consider a travel alternative to your day-to-day diaper bag. A backpack keeps both hands free, as does a crossbody bag. Look for one with a deep main pocket for diaper-changing gear, extra baby outfits, and an extra shirt for you. And then lots of small pockets and hooks to keep airplane tickets, phone wallet, sunglasses, and keys in easy reach. An outside pocket for your tablet or e-reader keeps it away from leaky bottles and other wet items. A large packing cube can compress space-hogging diapers if you don’t ship them ahead. And it will keep messy baby laundry away from your clean clothes on the way home. Give up on traveling exclusively with carry-ons for a while. A large soft suitcase with wheels can hold your clothing and the baby’s, and maybe even your spouse’s. It will cut down on the number of suitcases you pay to check and it’s that much less gear to transfer from curb to check-in and back again. Stick to your schedule …mostly. As you probably know, babies like routine. Nothing disrupts routine more than travel and holidays. Grandma might grumble when you pluck the baby off her lap for a feeding or bedtime routine. That’s OK. She’d be even less happy if the adorable child in her lap turned into a hungry, tired mass of unhappiness (and that change can happen in seconds!). Sticking to your routine as best you can will help you relax and enjoy your family time more. But you don’t get too crazy. If it’s easier for you to shift the baby’s usual nursing or sleeping times by a half hour or hour, that’s okay, too. Take advantage of having family at hand. Everyone will want to spend time with the baby. And as much as you might not be used to constantly handing your new childoff to other people, make a point of doing it. Take a long shower, have uninterrupted conversations, pop out with your partnerfor coffee, visit a friend, or maybe even take in a movie. When you’re back home and it’s just you and your partner,you’ll be glad you did. Smile andnod to get through. Your Aunt Gladys will insist babies should sleep on their stomachs while your cousin Meg will question why you are—or aren’t—using cloth diapers. Your sister will be defrosting homemade baby food while you open your store-bought jars. The answer to everything is:“Every baby is different. This is what works for us.” Then smile and remember that you’ll be back in your own space—for better andfor worse—in a few days’ time. 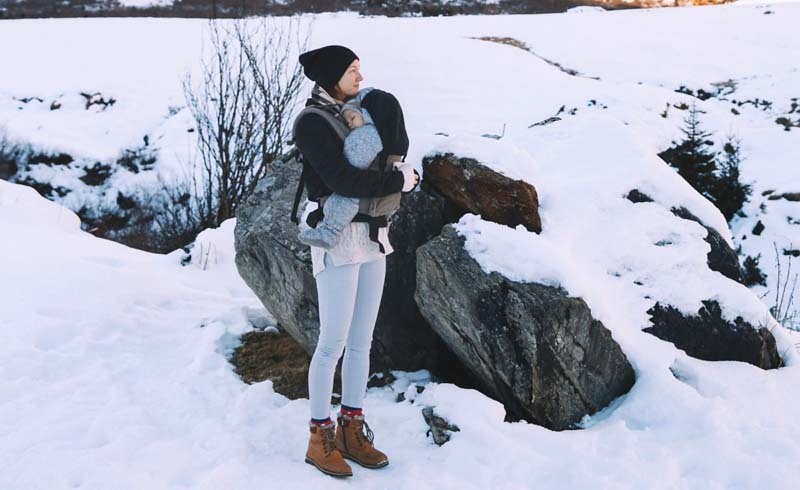 Use these five travel tips and tools to plan your stress-free trip home this holiday season, then report back if you found any great tricks for smooth travels with baby.